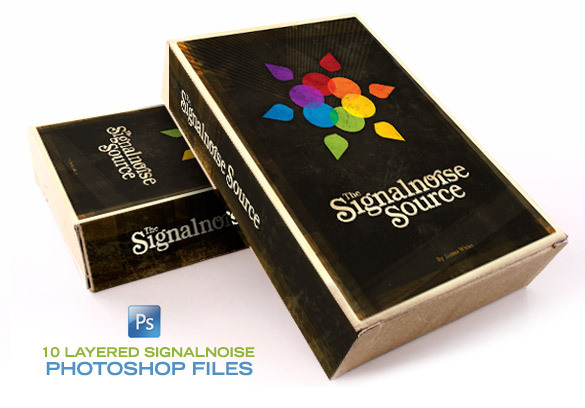 I’m really excited to announce the release of my Signalnoise Source group of Photoshop and Illustrator files now available for purchase in the Signalnoise Store. This project was originally supposed to be available through the order of a DVD, but I wanted to cut out the production cost and wait time of orders. So, I shifted things to a download for more instant usability. The purpose of my releasing these source files is simple, to show people how I work. I field many questions from designers via my broadcast, Twitter and email regarding process, so now you can have a look inside the files and even play with the elements yourself. All of the layers, modes and effects are intact so you can really get a sense of how these images are built by exploring each element. 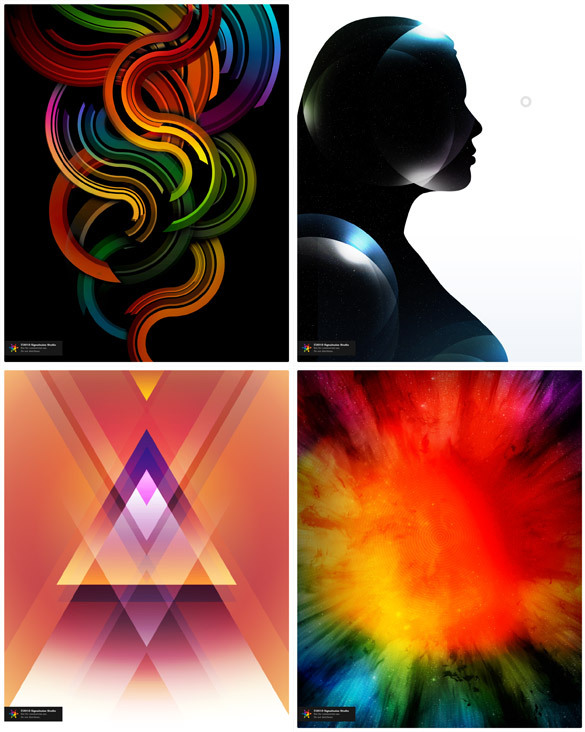 And if you used any of these files to create something of your own, why not upload your creation to the newly formed Signalnoise Flickr group. 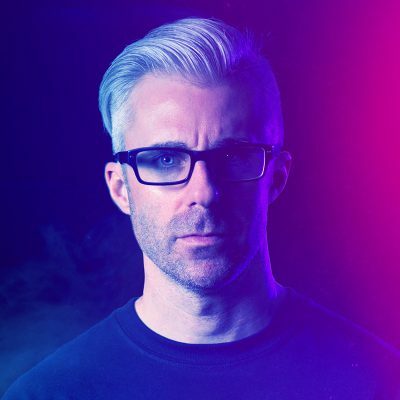 You can place an order for the Photoshop and Illustrator files over at the Signalnoise Store, each Photoshop file is 150dpi at 1200 x 1500. Once you place the order you will be able to instantly download the corresponding ZIP file. You will be ready to open these files up and start experimenting and creating right away. 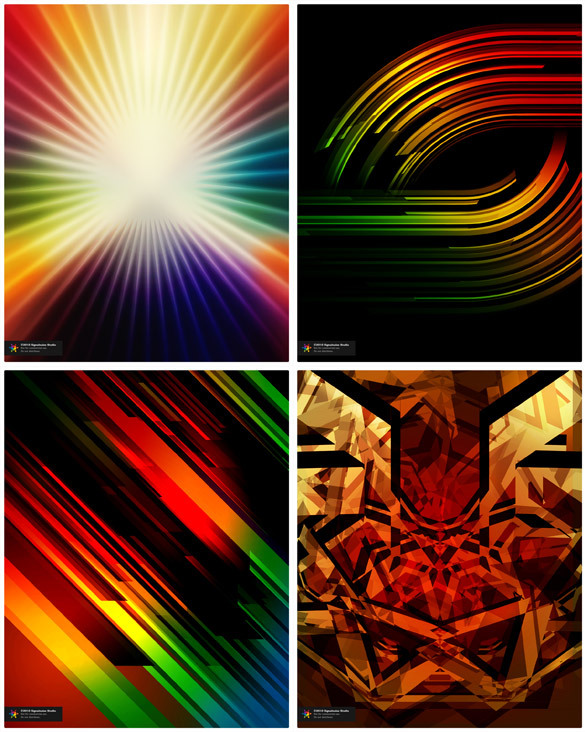 • Do not use these files or any elements for commercial work. • Do not resell any of these files or elements. • Do not distribute these files. They are for you, nobody else. • Do not print these files and sell them. I can’t stress it enough to abide by these simple rules. 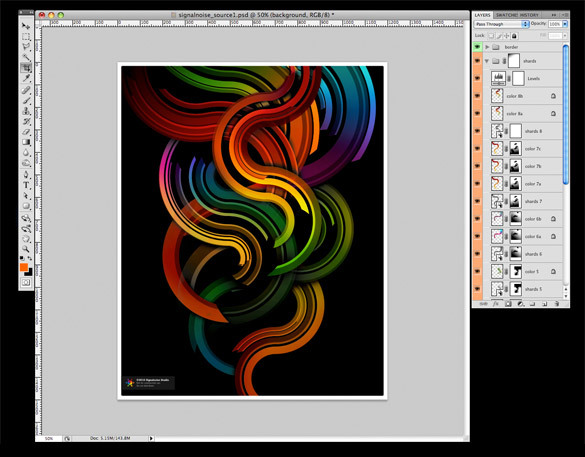 These files are made available to folks who would like a deeper understanding of Photoshop and Illustrator, how I arrange elements to achieve the effects I do, and for a launchpad for personal experimentation and visual exploration. In short, I want people to learn from these files and have fun using that knowledge to create, not use my hard work in hopes of making a buck. So, by purchasing and downloading these Photoshop and Illustrator files you are agreeing with these 4 points. Cool? 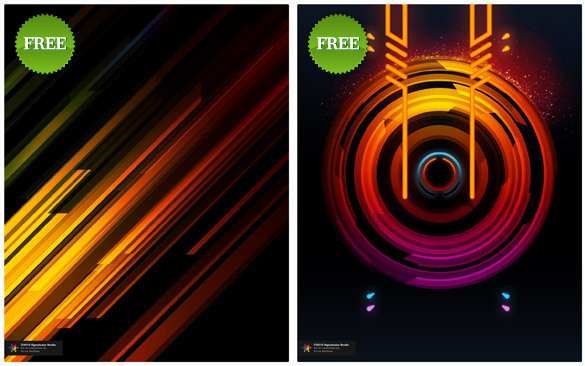 So, swing on over to the Signalnoise Store and place an order as you normally would. But instead of receiving something in the mail, you will get an instant download. Hope you have lots of fun playing with the elements I’m making available, and remember to post your creations to the newly formed Signalnoise Flickr group. Lets get this giant collaboration going, kids. Looks pretty great. I like your work. Ok ok, I read your entire post… I see it’s more of an educational thing. Cool beans. Hi Joe! I was just replying when I got your second note and you hit the nail on the head. These are for personal use and expanding on Photoshop knowledge, a lot of the stuff I talk about through my broadcasts. I get asked a lot about Photoshop process and I wanted to make these files available in order to properly show how I achieve some of these effects and designs. Plus, people can use these to create new images . . . kind of a cool, big collaboration. James, I think these are perfect for what they are intended for. I remember when I first began studying design, scouring the web unsuccessfully for something like this in order to deepen my knowledge of Photoshop and how to utilize the power of layers with masks and blending modes. I think this is an awesome resource for students and also for people like myself who love to learn new ways of doing things with software they use every day. Great job. Yeah dude!! Been waiting for these puppies to come out! Just need to save up the sheets! Can’t wait to learn from your work-flow! Ooo, now I get to see all your tricks and secrets. Soon, I will become the master, and challenge you for the spot of visual artist Jedi. I like your work, I own two of your posters, and you’re a chill dude. But why are you charging only 75$ dollars for 10 psds? Do you not think your intellectual properties are worth more than that? Being an efficient designer and understanding programs rather than gimmicks is a big part of pricing your services. I always value IP’s at a % of the overall project worth. We aren’t only selling designs, but ideas, and I think ideas are worth more than the design/tech. Curious on your thought process. Thanks and goodluck selling! I think that it’s his work and he has a right to charge for it whatever the reason or amount. Other than that … this is really cool James. @Mihai Of course its his right and his choice. I was just asking for his intellectual thoughts on IP’s and what if he considers this .psd’s as IPs. Cheers. Very cool James, I was going to ask “why not commercial use?” but it’s already been answered. I think that’s fair. We usually allow our customers to use the stuff for commercial use, but I can if you allow that, people can just use your straight PSD as their design and that’s not really helping anyone out. So good call on that. Btw James, I believe Simon hit you up about being involved in the Weapons of Mass Creation movement. What do you say? Is there a way just to get the two free ones? Didn’t really understand that part. Damn…psd source now for 150$ ? it was 75 yesterday…why you decided it to raise a double price? Mike Pigluiely – I think its because of you. Now you happy? Jeff, thanks for dropping a note, man! Yes, Simon contacted me a little while ago regarding the Mass Creation movement but I would like to get refreshed on what is involved. I’ll drop you an email soon. David, here are some links to those freebie downloads. They were released previous to my selling source files but I wanted them included. Grab them here and here. Jimy, pricing has always been problematic for me and this was especially challenging given they are source files. As of yesterday, I now offer individual PSD downloads so people aren’t limited to just the big pack. But, in order for the individual downloads to be worth my while I needed to price them accordingly, which obviously influenced the cost of the bigger pack. Just keep in mind you are getting 10 complete Photoshop files, quite a lot for $150. Bummed about the price increase…. It was obtainable before but now not as easy as a decision especially for some one who does this for just a hobby. Big fan of the work either way but puts me out of the game on this pack. Sorry Jimy! Hardwork pays off! I still think James is offering quite a bargain here. The guy has to make a living still and can’t be funding people’s private hobbies (@Larry), though I am glad it is a hobby worth pursuing. If you’re interested in getting better, hobby or not, and think this is a great help. You’ll pay. I still consider his pricing a steal, be happy for the opportunity. Thank James for making these available for learning purposes, and help others gain useful knowledge as they expand their Photoshop skills while developing good productive tips to organize project elements. Good luck, and keep up the impressive work! Are these still for sale? I’d love to buy the set but doesn’t seem like it’s available on your shop.